The Malbec Masterclass at 12.00 noon on Monday 15th April, 2019 will be presented by Albert Baginiski. Albert’s knowledge and passion for Malbec is inspiring; his presentation will examine the effect of altitude on the flavour profile of the Malbec grape. Although Argentina has a continental climate there are two key factors that impact on the quality of the fruit; they are latitude and altitude. Altitude in Mendoza varies from 600 metres to 1,500 metres above sea level. The higher the altitude of the vineyard the cooler the region. For every 165 metre increase the average temperature of the vineyard decreased by 1 degree and this directly affects the wine style. 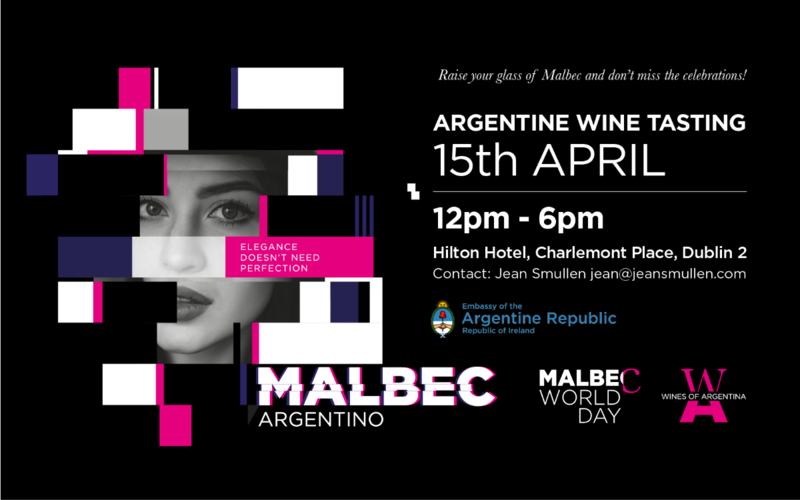 Those attending will taste a range of Malbec wines from a range of altitudes from specific regions and vineyards in the Mendoza region. About Albert Baginiski Albert has been working in Ireland for 12 years. He started his wine career in the restaurant at Donnybrook Fair before moving to L’Ecrivian for four years. Today, Albert is the wine buyer and group educator at FXB restaurants. Albert set up his own importing company Solera Wine Merchants in 2014, he imports wine from Spain, Italy, Argentina and France.